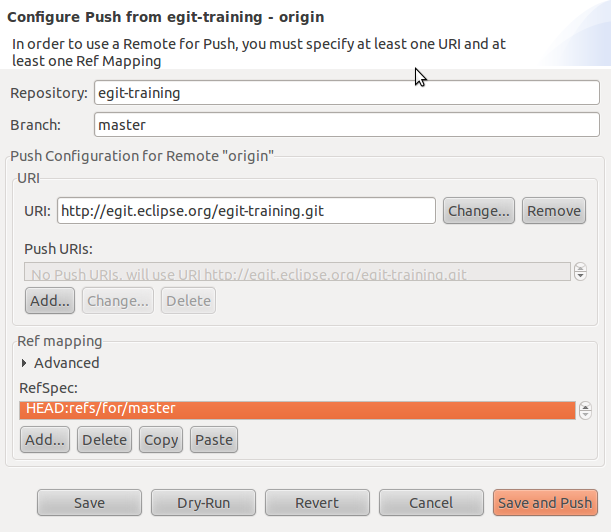 First of all, we had to prepare our desktop, using those instructions, which I did, one day ahead of the conference, using the official Egit repo (Egit 0.11.3) and eclipse 3.6.2. 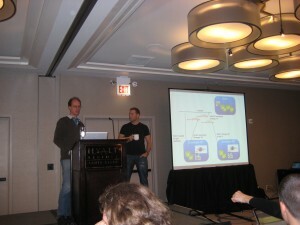 Four presenters were present : Stefan Lay, Shawn Pearce, Matthias Sohn and Chris Aniszczyk. For the tutorial, I chose the HTTP protocol rather than SSH, to make sure I would not suffer from any eventual proxies. right click : team->remote->configure push to upstream…, and then add refs/for/master in the ref spec (or else it will try to push to the master repo); the magic Ref refs/for/master represents the Gerrit code review queue for the master branch on the server. Then click save and push, it will fail because there were no changes; but you just had the opportunity to check your settings are ok.
All the exercises are described here. During those exercises, we created a local change, then submit it for a review in gerrit. Just after sending my changes, Hudson was triggered to launch a build against my local branch that I just committed. Then, the build passed (alright !) and it was really fun since people in the room would review my changes with comments; finally someone approved my changes and my changes were merged into the master branch. Actually, I was really impressed with this tool : it really changed the perception I had of code review (with patches sent via email + code review on the desktop of the co worker); just letting the developer do all the changes he want, then see Hudson builds his changes, ask a reviewer (or a reviewer adds himself to the bug), see the file to file comparison, the comments in the gerrit web interface… I’m totally convinced !!! Social coding for real ! I did not expect so much from this git and gerrit tooling, you got to see it to believe its awesomeness !!! Hello Alex ! Thank you for spotting Chris, it is now corrected !